This season started out having the potential to be the best ever for Whitlock, with the general opinion among the darting cognoscenti just two months ago being that he was all but locked into a Premier League return, but a poor couple of months since then and it's looking a lot more shaky than it seemed. His kickoff was great, winning two out of the six UK Open qualifiers, finishing one off with wins over Wright, White, Chisnall and Gary Anderson, the other having a bit of an easier run, with a toughest opponent of Rob Cross before he really started cooking on gas. He'd get to the quarters of the main event, having first tacked on a Pro Tour semi final in the opening event of that season, but Daryl Gurney was able to hold his own in a deciding leg. Simon would quickly append another ranking title on the floor the week later, seeing off Gary Anderson, Kim Huybrechts and surprise finalist Darren Johnson (who'd just knocked off MvG in the semi), and would add what'd be the first of three European semi finals the month after. 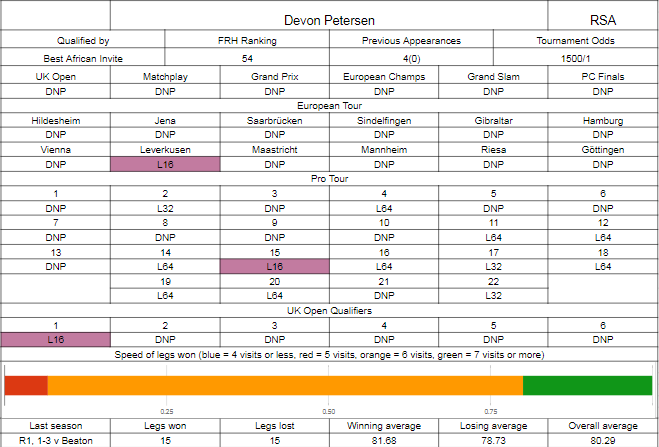 The Matchplay went about as well as it could given he was the 16th seed, and hence got van Gerwen in the second round, but it was the Grand Prix where he peaked, reaching the final with wins over Kist (dodging a match dart though), North, an in form van de Pas, then beatin Suljovic in the last set of the semi final. In the final against Gurney he got that far again, but his game went to pieces, needing far too many darts to get away in the first three legs, then at 2-1 down he did get away second dart on throw, but four visits without a treble allowed Gurney to set up tops before he could even leave a finish and we all know what happened then. He did well in the European Championship, beating Richardson and then winning ten legs unanswered against Alan Norris before running into MvG yet again, but would finish bottom of his group which included a kid with dartitis and the de facto last BDO qualifier, and then after taking the free win against Christian Kist in Minehead, lost the very next round to Jan Dekker. He could still make the Premier League but really needs to make the last 16 here you'd feel. 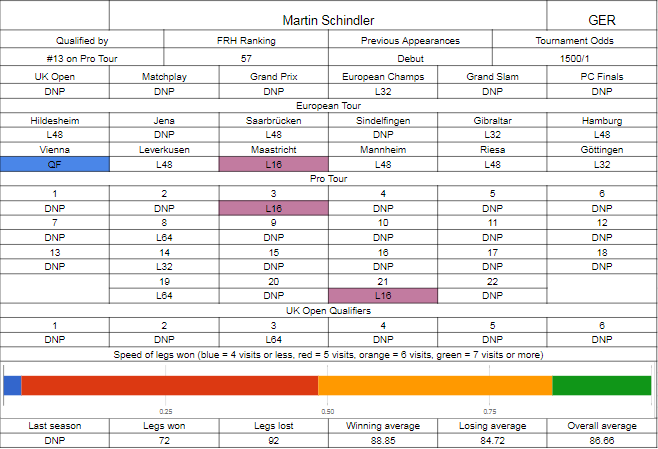 Schindler has now, in the FRH rankings, overtaken Max Hopp to become Germany's number 1 player, a remarkable rise for the 21 year old, obviously helped by Hopp doing absolutely nothing all year, but still, nice work. Winning his tour card on the final day of play, Schindler had a fairly slow start to the year, not qualifying for the UK Open, but he did get an early first board win on the Pro Tour, beating Ian White and Ronny Huybrechts before losing to Mervyn King, but from then he'd start a run doing what's got him here (and why Hopp isn't) - not messing up the European qualifiers. Hardly ever. The German ones are probably the easiest but you still need to go out and win them, and he did, 10 times out of 12, only missing Jena and Sindelfingen (i.e. he won through the European qualifiers when needed outside of Germany every time) to surprise domestic defeats. Once there more often than not he's lost in the first round, but it all helps to gain stage experience, and he's managed to reach Sunday twice - in Maastricht he beat Gerwyn Price, while in Vienna he beat Ian White and surprise package Jamie Bain. He also played in the World Cup, reaching the quarters with Hopp and giving van Gerwen a minor scare, grabbing a 2-0 lead in a race to four to leave very little margin for error. The European consistency saw him qualify for Hasselt, but he drew Rob Cross and lost 6-0, while he was also able to make the quarter finals of the world youth championship, where he lost to Development Tour winner Luke Humphries (a tour that Schindler plays and has won on this year - a tough run including wins over Rowby John Rodriguez, Kenny Neyens, Steve Lennon and Justin van Tergouw). Two months ago this would be an obvious Whitlock win. It probably still is, as while Schindler's gained a lot of experience, the first time at the worlds will still be somewhat daunting (although the Germans usually travel in numbers so he should have some support). 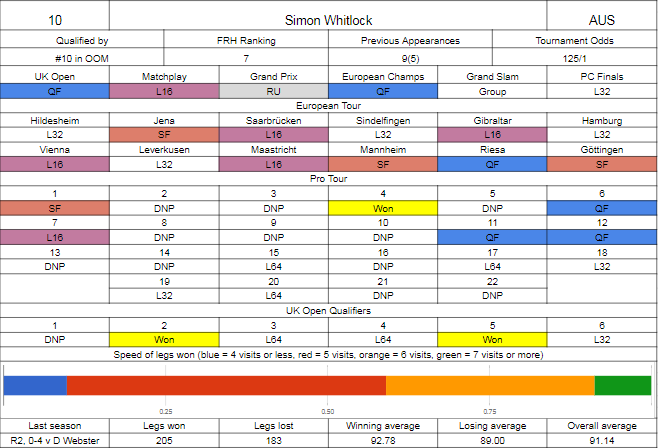 That said, Whitlock's been stalling a little bit, and if he's not on his game, Martin's got enough to be able to capitalise. The first set could be crucial in this one, particularly if Simon was to lose it. 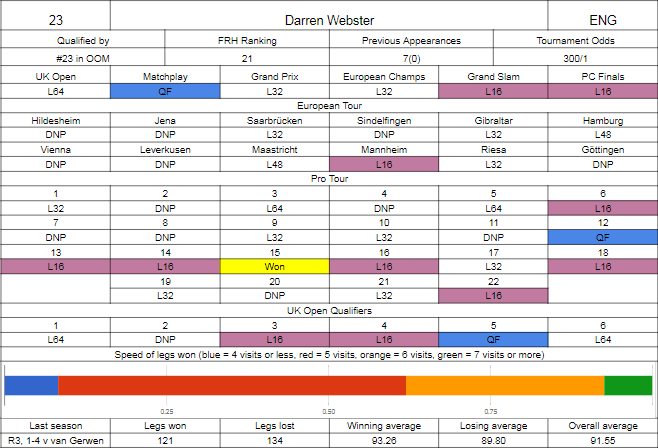 This season's been one of great consistency and consolidation for the surprise package from the end of last season, as Darren Webster's had an excellent floor season and some TV highlights as well. He made the UK Open comfortably, but in a surprise result he would lose 10-8 to Ronnie Baxter in the first money round, but after a moderately slow Pro Tour start through to late April where he was not doing much at all, he'd then kick into gear, both in the Pro Tour and in the European qualifiers. Looking at the latter first, he made five out of the last eight events, and while he was only able to get the four wins (over Richie Corner, Ryan Meikle, Alan Norris and Luke Woodhouse), it was enough to get him to Hasselt where he drew Ian White and missed two match darts in a 6-5 defeat). On the Pro Tour, from May onwards he went on a remarkable run of winning his board seven times and reaching the board final three more times, capped off of course with a first ranking title in years, being able to beat Alan Norris, Kyle Anderson in a deciding leg and then Daryl Gurney 6-1 to claim the win. This set him up to appear in all of the TV majors (needing to qualify for the Grand Slam but doing so), the Matchplay being the highlight with a quarter final run, beating Wade in overtime having come from behind to level it, outduelling an inspired Steve West before giving Peter Wright a run for his money in a narrow 16-12 turnover. He might have been able to do better in the Grand Prix where he took Joe Cullen to a deciding leg but was always on the backfoot against the darts with Cullen starting perfect, he realistically got what he could out of the Grand Slam, needing a shootout to advance to face Phil Taylor, and in the Players Championship he left little on the table as he got to a last 16 tie with Michael van Gerwen, where there was to be no repeat of last season's potential upset. Petersen's here on account of being the highest rated African player in the Order of Merit (which I assume is the same as being the lowest rated African player in the Order of Merit unless I'm overlooking someone obscure), an interesting invite to say the least. We've not seen much out of him at all - while he did start well in the very first event, making a last 16 run in a UK Open qualifier beating Kim Huybrechts amongst others, he cashed none of the others and needed to beat Jermaine Wattimena to make the money, which he didn't manage to do. From there, he'd bust out in the opening round in eight out of the first ten Pro Tour events, and while July saw him hit a little bit of form with a run to Sunday in Leverkusen, beating Richard North and Jelle Klaasen, followed by his only Players Championship board win of the season, beating Burnett, McGowan and Rowby John Rodriguez, that'd very much seem to be a blip rather than the expected result, as he'd finish with around a 50/50 record for the rest of the year. A poor season where he didn't do enough to make Minehead, and his great strength from last year, European qualification, disappeared as he went 1 for 12 in qualification attempts, losing out in the final round five times. Think what you like about Devon's place here, he's here now, but probably won't be for too much longer - he's not played anywhere near well enough all season, and Webster is the type of player that's not going to give him too many chances. Look at the legs that he did win in Leverkusen - only ONE was in fifteen darts or less. That's quite a lot of legs to be effectively gifted, and Darren won't be doing that anywhere near often enough for Petersen to have a realistic chance of moving forwards.